I've been twirling the idea of starting a blog around in my head for a while, but it took a post by Guy Kawasaki + a recent article in Slate about female ambition to finally be the motivators I needed. Why would these two things motivate me to try my hand at blogging? Two reasons. One, there are a lot of new “pre-MBA” positions in Venture Capital (my position included) and this category will only continue to grow. The responsibilities of these positions vary from firm to firm, but they include some mixture of sourcing (i.e. outbound calls to startups) and diligencing. But as Guy’s post seems to indicate, there is a whole lot of misunderstanding out there about why these young kids are moving into VC-land, what their motivations are, and how to deal with them. I hope to chat a little about this from time to time. Second, there continues to be an amazing dearth of women and minorities in venture capital and start ups. For example, currently I am the only female in my firm of 30. (Perhaps Guy should have added that as one of his test questions? “If you are white / Indian / Asian, +2 pts. If you are male, +3 additional points”.) Being an empowered woman (aka feminist), and having been involved in feminist organizations in college, I am inclined (make that, starved) to talk about these things. In many ways, for me, being the only woman in my firm has been a great social experiment. It has challenged me in more nuanced ways than I originally thought it would. This really hit home when I read the Slate article on female ambition. It is a worthy read. So that is my first entry (gasp!). A counterpost to Guy’s post will hopefully follow…. But future posts will most definitely not be limited to reasons one and two. I'm salivating already! can't wait for more. 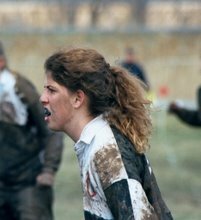 also the rugger picture is hot. Future of SaaS: don't forget the data!